In recent years I’ve attended reunions of the staff from my boyhood camp. It is inspiring to see how the lessons learned have helped shape the men we’ve become. It is from this vantage point that I listened to President Trump’s recent speech to 40,000 boys and adults at the Boy Scout National Jamboree in West Virginia. I was offended by the tone and content of his speech and his ignorance of the values that we as members of the scouting family aspire to. Mr. Trump began the official address, delivered from a podium with the presidential seal, by pledging to talk about things loftier than politics. He quickly pivoted to a litany of personal slights, threats against those who don’t support his legislative agenda, criticism of President Obama and a series of rambling stories, none of which were relevant to the audience before him. Rather than speaking, Mr. Trump would do well to listen to any twelve-year-old scout recite the Scout Oath and Law. These boys have a lot to teach him. As boys at Camp Yawgoog we were taught the importance of keeping your word, treating others with kindness. We were taught how to lead others with a mix of personal integrity, strength of character and working as a team. We learned that leadership was not about personal glory but working for the well-being of the community. We learned to be good stewards of the land and to leave no trace when camping. Scouting taught us to think not only of ourselves and immediate needs but to think of the generations of scouts who would follow us. We were committed to leaving future generations a world with clean water and air with healthy forests. 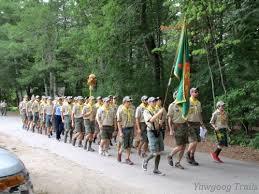 In short Scouting taught us to be good citizens and how to grow up to be men of integrity and honor. This is what every twelve-year-old scout aspires to become. I think our president has a lot to learn from a boy scout. It isn’t about angry tweets, throwing adversaries and even friends under the bus. It isn’t about inflating or bending the truth for ones own ends. Donald Trump would be a better man and leader if he could learn the lessons of scouting and take them to heart. He’d be well served to listen to any twelve-year-old recite the Oath and Law. Like your message “scout”. Keep up the good work! As an Eagle Scout, and father of another and two grandson Eagles, and living as best I can by the Oath and Law, I am disappointed in Scouting leaders willingness to take the risk with a failed citizen occupying the White House. Donald Trump has proven that he cannot stay on task. Scout Leaders, including at National Headquarters, should take the time to communicate with those attending the Jamboree to use this as a teaching moment on what good citizenship is by reviewing what defined each element of the Scout Law. There is no need to address Trump’s behavior — the Law and Oath speak strong enough. John, I’m an Eagle too. Appreciate your thoughts that this is ‘a teachable moment’ for those scouts who attended the Jamboree and all who love scouting. Many of us are closely watching how the BSA handles this. After a few days delay BSA did voice their concern regarding President Trump’s partisan tone. I wish however their words had been stronger related to his divisive tone and crude language. … On a side note nice to hear from Oregon. I lived in McMinnville for 20 years. A great part of the world. All the best.